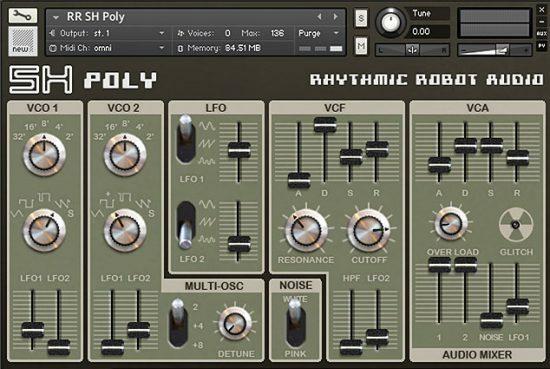 Unique and peculiar vintage analog machine, now with added polyphony • Detunable and stackable oscillators; use the original Presets as additional tonal layers • Modern controls can be switched in or out – play the original 102200 or bring it into the 21st Century! Very simply, this one just spoke to the geek in us 😀 The 102200 is the Hammond Organ corporation’s only stab at producing a synthesiser. As such, it’s both very rare and very odd. Clearly Hammond had seen what Moog, Arp, Roland and others were up to, and had decided to jump on the monosynth bandwagon. The thinking must have been along the lines of, We already have keyboards. All we need to do is add the synth. Which is what they proceeded to do – but in the weirdest way possible. First of all, instead of calling it the Rogue or the Soloist or something catchy, they went for 102200 (which sounds like a Beverley Hills postcode to us). But that was just the beginning of the madness. 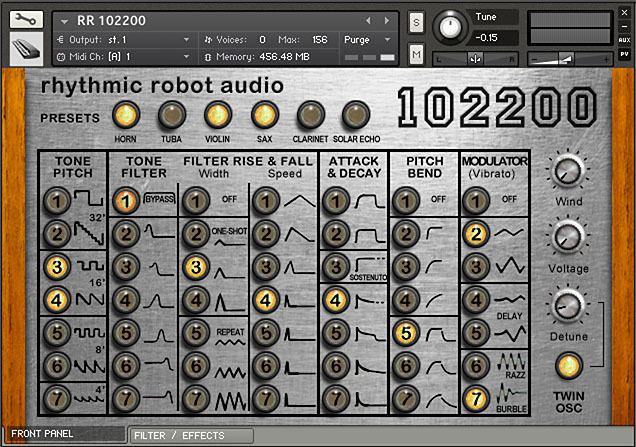 102200 ships with a factory sound library of over 80 patches, which were designed by our good friends Anatol Locker and Ed Ten Eyck. You can hear some of Anatol’s tracks here, and if you want to print your own synth, have a look at his day job here. 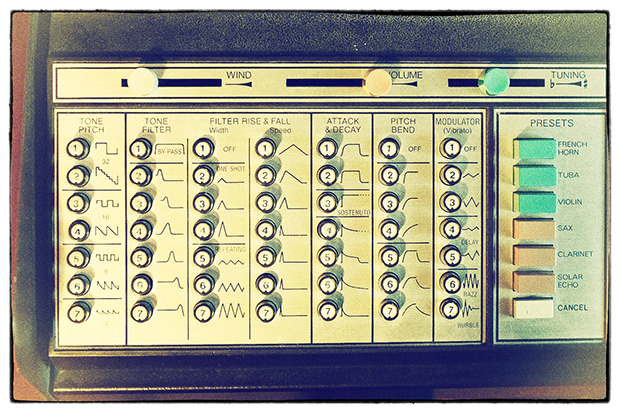 Ed does sound design for other synths too, so take a look at his brilliant patches here. (All our Kontakt instruments require a full copy of Native Instruments Kontakt v4.2.3 or higher (including all versions of Kontakt 5). Kontakt Player is not supported: instruments will load, but will time out after 15 minutes. See the FAQ for further information.) 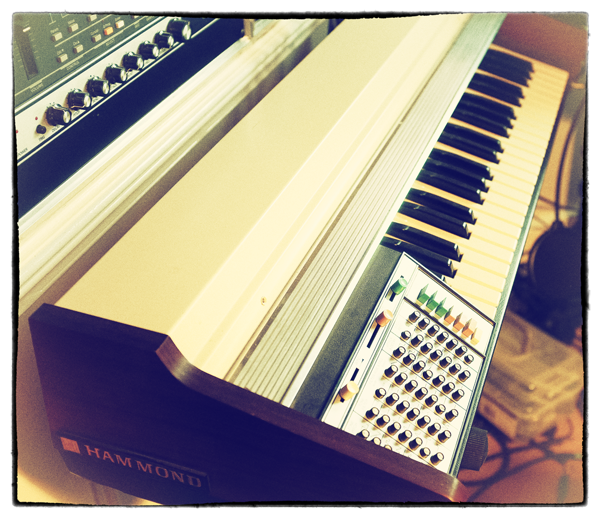 You can read more about the original Hammond 102200 here. Best value, 484+ wav audio files bundled with kontakt instruments. Many great presets, but also a seemingly endless number of settings to explore to carve your own sounds. Patience required, but it seems to be worth it. Some selection combos don’t seem to change much (if anything) in the sound, and sustain is sometimes a bit elusive in some presets, other than that it’s a very worthy instrument, especially considering the price. As others have noted, the push buttons while weird at first are very usable as a computer interface. You click a few buttons and quickly are in the general ballpark of the sound you were looking for. Turn it around to tweak the one or two parameters you could not get right from the preset buttons and you are home. The buttons could be described a little clearer, e. g. the pitch bend 5, 6, 7 engage glide and IIRC it is not mentioned in the tooltips, so it takes some clicking around to grok what exactly do some buttons do. However they did mention that burble is a cool effect and it is. So overall a very usable, somewhat different synthesizer. ¡I love that analogue sound!, this is just perfect for the music im doing, good quality, low price! awesome, five stars. I love that analogue sound, this is just perfect for the music im doing, good quality, low price! awesome. These guys can do no wrong. 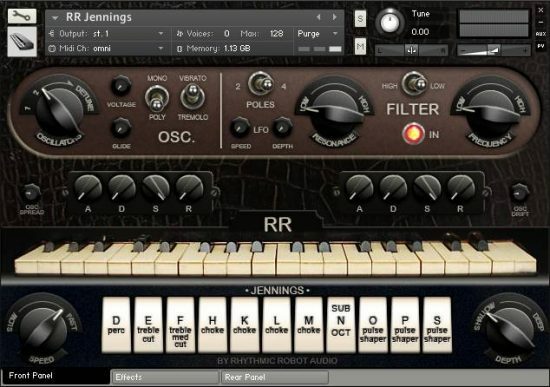 I’ve loved every instrument RR has put out and this weird Hammond synth is no exception. It’s got a real analog grit to it and can produce both rocking and ethereal sounds. 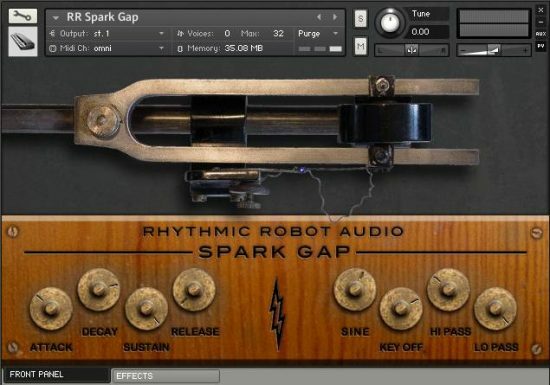 All of their presets are great and the options are limitless when it comes to tweaking the instrument. Highly recommend. Sort of like that cousin at family reunions. You think he’s gonna behave and all of a sudden he does something rude. Amazing virtual instrument, one that I didn’t know existed until this release. The button system is unusual, but works great on a computer, and the patches that com with it are just awesome. Perfect toolbox for a sound designer! 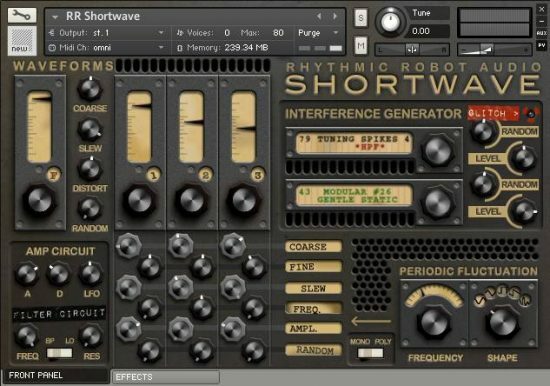 The simple fact of the matter is that even if the push button system was a little unusual for a synth, it is perfect for translating onto a computer based platform and Rhythmic Robot Audio have done a brilliant job with that translation and then taken it a step further and improved it. The supplied patches give a good indication of what this thing is capable of and although it appears a little limited at first, the permutations available with all those buttons gives plenty of scope to craft your own sounds. Add to that a great filter and effects section and you have a instrument where the sonic possibilities will keep you coming back for more. From spacey soundscapes through rusty basses to squeaky leads, the 102200 will do them, but it will do them in it’s own special way. The 102200 is like the kid that nobody ever picks to play on their team. However RRA have picked him, and out of the blue he has proved he can play with the best of them. one minute it’s doctor who noises, then it’s RR classic crusty organ, and then it’s all gritty basses and swirly shapes.